We now have brand new stock of the Dell colour laser 1320C and 1320CN toner cartridges. These remanufactured (recycled) toners are not only environmentally friendly but offer huge savings on genuine Dell products. SPECIAL OFFER - Epson compatible T0711 - T0714 printer inks less than �2 each!! Our most popular cartridges receive an even better price when you buy our special 10 pack. 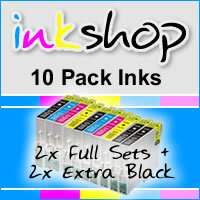 Each pack of 10 ink cartridges contains 4x blacks, 2x cyan, 2x magenta and 2x yellow. The best bit is of course the price - just �19.99! Start saving money now. This is a permanent online deal and applies to all the Epson printers that take the 'Leopard' style packaged cartridges. Models include the new SX and Office BX range, as well as many of the older D and DX printers. So wether you're looking for cheap SX200 inks, or a low cost cartridge for your Epson Office BX600FW then you're in the right place. After months of waiting for a ready chipped compatible for the new Canon multi-ink printers, we're pleased to annouce they're finally here!. These cartriges offer significant savings over the Canon originals at less than half the price when bought individually, and they get even cheaper when you buy one of our pack deals. Browse our large range of compatible and original inkjet cartridges. We offer low cost HP Original, Genuine Lexmark, Cheap Epson Compatibles, and Canon Inks, as well as Brother printer cartridges, plus other names such as Samsung and Olivetti. We also stock a range of Inkjet Photo Papers, Refill Kits and Cables. Compatible Ink Cartridges are generic versions of the manufacturers original inkjet printer cartridge supplied at MASSIVE DISCOUNTS. Save literally pounds per cartridge when choosing a compatible over an original. All of our compatible inkjet cartridges are manufactured to the very highest quality standards to ensure 100% reliability, 100% print quality and 100% ink capacity. The specially formulated inks used in each cartridges are specifically designed to equal and exceed OEM performance. All cartridges are 100% new, 100% compatible and are manufactured to the highest ISO 90001 standards for the EU. We stock a wide range of original printer cartridges, at below high street prices to save you money. Original cartridges are designed to work specifically with your printer and offer the highest quality inks available. If you are looking to save your self money we would recommend that you try a compatible printer ink cartridge.